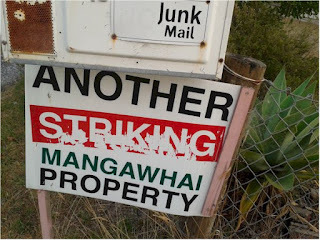 This is an example of the signs that have appeared on many Mangawhai properties since the Rates Strike commenced against the actions of Kaipara District Council. You can see other pictures here. For a while there was some thought given to preparing a sticker that would repair the damage done by the "BLUDGER" sticker. This was one of the ideas that was considered. They're a creative lot those organising the resident's campaign. But for the moment the decision is to leave the battle-scarred signs as they are. As for the ratepayers and residents themselves - the "BLUDGER" sticker has just made them all the more determined to see this particular battle through to the finish. In the golf club (where else?) 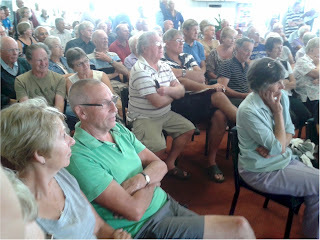 on Monday 18th February at 9:30am, about 300 Mangawhai ratepayers crammed into the biggest space that could be found, to hear what the four government appointed commissioners had to tell them, to ask questions, and in some cases to make statements. Kaipara District Council's advertising for the meeting explained that in part the purpose of the meeting was to introduce plans for the future. In his introduction, Mr Robertson, explained the initiatives that the commissioners would be conducting over "the next 30 days" would be to "fix historical issues" and to "propose amendments to the Long Term Plan". A big set of initiatives that one - especially fixing historical issues. We were all on tenterhooks. Next Mr Roberston "set the scene". He explained that the council deficit for the year 2010/2011 was between $5m and $7m. ie that the council spent that much more than it earned through rates and charges in that year. He talked us through the history of the government appointed Review Team, and reminded us that in September last year Commissioners had been appointed. 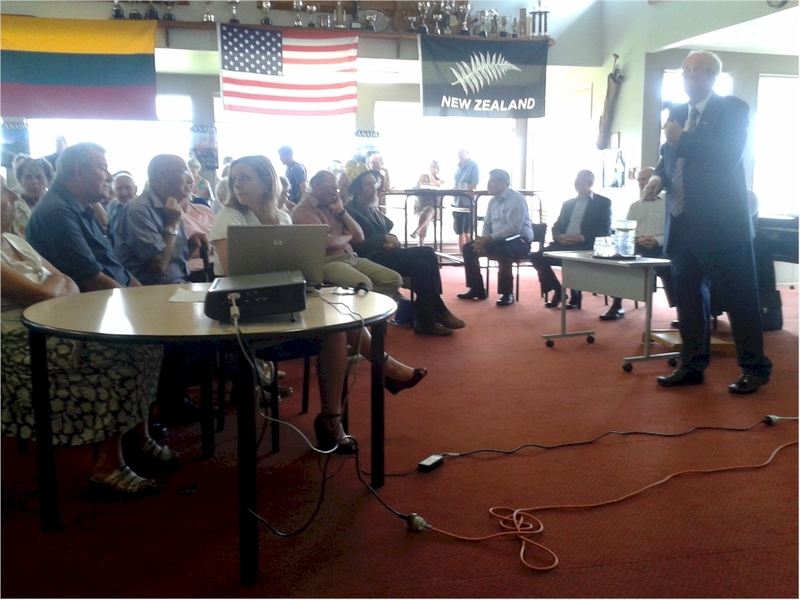 He explained that their view was that they needed to make Kaipara District Council "fit"; prepare it for elections in October 2015; and "reassure the banks and auditors" (he didn't explain how that was done....). This was where the meeting began to warm up. I mean get heated. Robertson asserted that Commissioners could only deal with issues going back 2006. He said, under law, breaches before 2006 cannot be challenged. 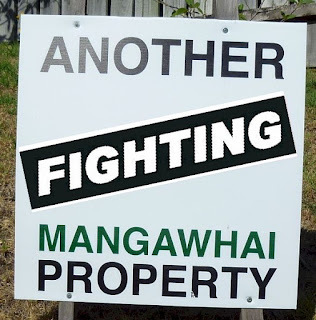 Bruce Rogan, chair of Mangawhai Ratepayers and Residents Association jumped up at that point to assert that the community did raise issues that went back before that, to 2002. And reminded commissioners that they had not been dealt with then, or since. Robertson continued. Reading from his script he told the crowd that, regarding the issues that went back to 2006, that they were "technical issues" that they were "technical discrepancies" and "technical breaches of the Local Government Act" - but that "services had been provided" and that "rates were levied correctly..."
At this point Clive Boonham jumped up. Angry. You can see his comments in his posting here. He was outraged that what he saw as a litany of errors and inequitable treatment of ratepayers could be explained way as "technical errors". Robertson continued. 2nd, that KDC would refund all the rates that were collected incorrectly, and set new rates. This would mean that old rates would be "cancelled". He said that would not a fair way of doing it because some of the problems go back to a time when properties may have been owned by other people. So it would be inequitable. Man oh man. Did this get Clive going. Robertson went on. The Bill will be introduced in Parliament, and then there would be a Select Committee hearing. They "might even meet in Dargaville" he said. (What a concession!). But the bit that really stuck in my gullet was when he indicated that "ratepayers who are current will not be required to pay any more...". This sounded like a whack for rate strikers. It sounded like a punitive and vindictive whack against ratepayers concerned by the history of illegal goings'on. The crowd was getting restive. Robertson went on to talk about EcoCare specifically. He mentioned "allegations of fraud", and said that the Office of Auditor General's investigation was the largest investigation being conducted by the OAG at present. Probed later we learned that the OAG's report might not be done "for months...". Somewhere in here commissioners were at pains to point out that the Bill would not be dealing with the issues that the OAG was looking into. Robertson was getting near the end of his presentation by now. His last few slides dealt with what will happen in 2013 to the Long Term Plan. How it will be amended. First of all he explained that Commissioners had reviewed the 2012/2022 Long Term Plan (that's the one that MRRA's legal opinion condemns as unlawful). He said they've done that (it would be good to see a copy of that review). Now the commissioners want to propose amendments to that plan. Clive again jumped up and asked "how can you amend something that's not legal?" Robertson ploughed on. "We're going to simplify rates, we are going to change differentials..."
One of the problems with the 2012/2022 Long Term plan, Robertson explained, was that it only provided for 10% of the EcoCare debt interest being paid off. The rest of that interest liability was capitalised! This was news indeed. Confirms the bad to worse concerns of ratepayers. He said, "so for 2013/14 we intend to pay all the interest..." He also said that the commissioners planned to reduce the debt from $80million to $50 million by 2022. Then Robertson sat down. Colin Dale stood to manage the rest of the meeting. He introduced Peter Winder to explain about the proposed Bill a little more. Peter Winder explained that the Bill "was 20 pages". It deals "with all of the technical errors that the KDC could have done legally..." Clive was very hot under the collar now. "What about units of demand...?" Winder responded indicating that it was a mess, "but that if KDC had adopted a different definition it would all be OK...". Winder confirmed that "nothing in the Bill deals with the KDC decision to double the size of the scheme, the $28 million, nothing in the Bill seeks to legitimise that...". That was good to hear. Clive continued to be very concerned about the proposed Bill. He asserted, "you cannot validate rubbish." At this point I got the opportunity to ask my questions. 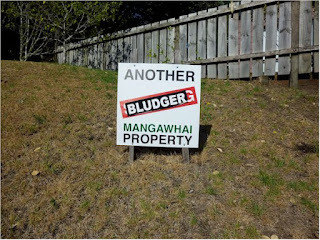 Question: Given that you said all of the Ecocare interest is to be paid from now on, and that you plan to repay $30 million of debt over the next 10 years, and that you will be putting these numbers in your March amendments to the Long Term plan, can you tell us now what the average rate increase will be for Mangawhai residential ratepayers? Well. This had them jumping through hoops. After a while Steve Ruru, CEO of KDC, explained that it was proposed that the increase in debt interest payments (versus capitalising the interest and just adding it onto the debt) would be phased in over the 10 year period. I didn't quite catch the detail of this, but it sounded like the goal was 50% of debt interest paid in the first year, then a further 12.5% next year, and so on, so that after 5 years, all of the debt interest would be being paid out of earnings. At one point someone did ask what interest rates they were being charged and we were told 6%. (So - if the debt is $80m, then the debt interest is currently $4.8m/annum. And if only 10% of that was paid in the current financial year, then the debt has increased by $4.32m this year - just because of KDC's inability to pay interest). 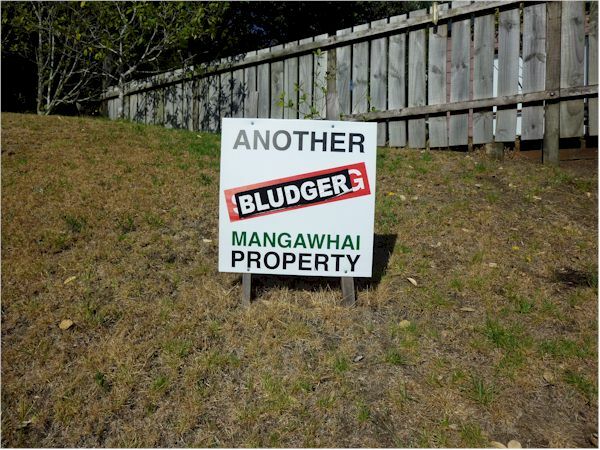 Question: Does the $80 million include the Mangawhai Endowment Fund monies of about $5.6 million? Answer: No it does not. The $80 million is just external debt. Mainly bank loans. 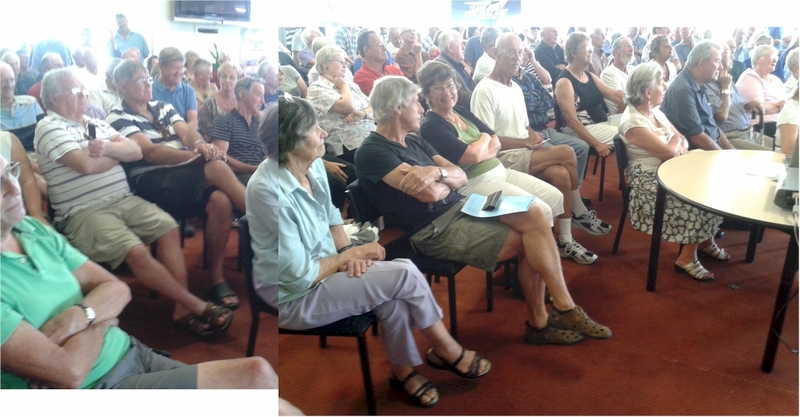 Q: So where is the money, where is the Mangawhai Endowment Fund? Q: So. What interest are you paying on the Endownment Fund. You say that there is $60,000 available this year from the fund. Based on interest from the fund. $60,000 isn't a very good return on $5.6 million is it? And so it went on. Many members of the crowd asked questions, made statements. presented their own findings and research into rate increases. One man had gone into KDC's rating database over the past few years and found - to his consternation - that farms and commercial properties had generally experienced sharp drops in rates, while residential property rates had sharply increased. (This would relate differentials being changed. Interesting research.) 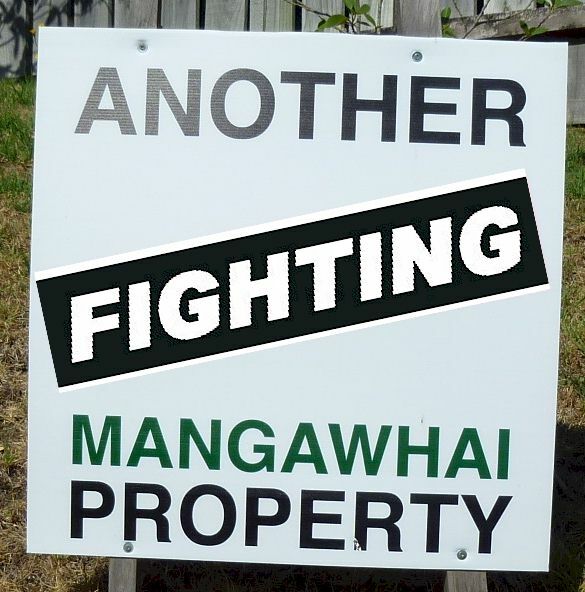 He also found that properties of the same value along Alamar Crescent in Mangawhai. had increases varying from 8.1% to 35% - a fact that commissioners could not explain. If that was sorted out we wouldn't be here....? This is the boil that needs to be lanced. The days of councils "inadvertantly subsidising" developments because they haven't costed the full cost of providing those services are hopefully long over. You want it... You pay it's full cost. This saga is going to run and run. First of all it was the councils that were to blame because they would not free up land at the urban boundary. The argument against that - that I used and so did many others - was that land price alone is not what makes housing affordable or not. You can see my posting about this here . It raises questions about the narrow focus of the Productivity Commission on what makes housing affordable (or not). It discusses what gives land value, and also discusses the true costs of accommodation (not just the house). 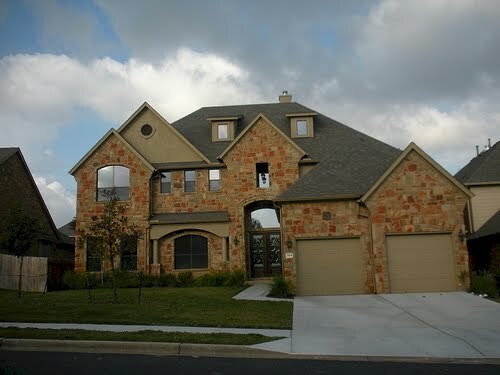 In this posting I explore another aspect - and that is the tendency to build McMansions. I don't think it will be until interest rates go through the roof, or a sensible capital gains tax regime is introduced, that New Zealand will see the housing bubble pop. • issue 3: lack of incentives within the current development contributions system for smaller or more affordable housing. • issue 6: the ability to use development contributions to help recoup costs of meeting increased demands on infrastructure is not consistent across all providers of infrastructure. • Issue 8: aggregation of developments of different sizes, characteristics and locations in development contribution policies does not reflect the actual demand on services and can result in inequities through under or over charging. • issue 9: the amount of detail and effort put into development contribution policies can result in increased complexity and reduced transparency without a commensurate increase in accuracy and fairness of outcome. • issue 10: current challenge and dispute resolution mechanisms are expensive and time consuming, or lack transparency. Issues 1 and 2 are obvious, and basically what the the development regime system was put in place to achieve. Before 2002, I saw, as a councillor, that existing ratepayers were subsidising new housing developments in Albany and other parts of North Shore City to an alarming and unfair degree. "Intergenerational equity" was the catch-phrase used by those supporting the status quo. Issues 4 to 6 appear to call for a bit of a tidy-up in the legislation. Issue 7 is interesting. In my experience, Councils always undercharge the true cost of infrastructure provision to developments. The reason for this was an inbuilt conservatism, and fear of litigation (though I know very well that NSCC's decision to allocate the full 100% busway cost to new development was successfully appealed in the High Court - but that was an exception - not the rule). The approach adopted by Councils was like: "get an estimate for new infrastructure costs, then halve it, then everybody will be happy...". The thing was of course that meant about half the cost of infrastructure needed for development or subdivision - was socialised. Allocated to other ratepayers by default. That still means that the developer, and the new home owners would have their infrastructure costs subsidised. If anything, I would argue that developers and new home owners are routinely subsidised by existing ratepayers. That's what needs to be fixed. There are useful appendicees in the report, comparing development levy regimes in Australia, parts of the US and Canada. But it is notoriously difficult to do this. For example, Australian state government provides water and wastewater services in Queensland (it's not provided by local government), aspects of state education are provided by local government in the USA, and so on. Comparisons become useful when they are analysed by service type (eg water, wastewater, stormwater, roading, public transport), and even then it is difficult because a water poor area (eg Melbourne) has different challenges and risks to Auckland (a relatively water rich area). 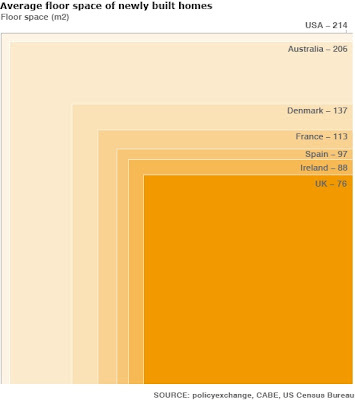 In terms of housing affordability, the most interesting appendix to look at is Appendix D. This shows that New South Wales and the United Kingdom both collect development levies to fund the construction of affordable housing - which is considered in these jurisdictions to be social infrastructure. In past years New Zealand took a similar approach and invested substantially in council housing and state housing - recognising that "social" housing is a social imperative and an unavoidable necessity. That the market cannot and will not meet that need. And for the last bit of this posting, I would like to share this last bit of research. This is a picture of part of the Great American Dream. The McMansion. Whole suburbs are taken up with them. Many bedrooms. Ensuite bathrooms. Garaging for many cars. There's quite a few now in New Zealand too. An extension of the quarter acre pavlova paradise idea. 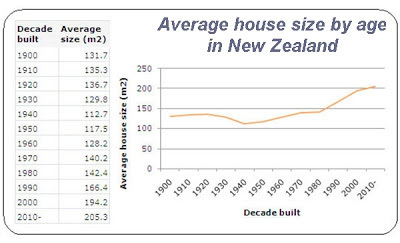 This graph (from Tommy's Wellington Real Estate website) shows the effect of this trend in New Zealand. 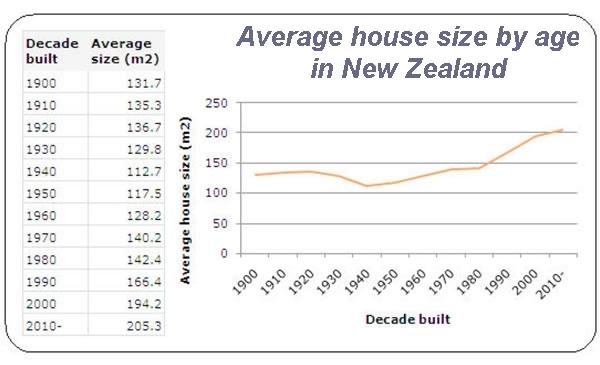 He explains: "The average floor area of a house in New Zealand, is 149 square metres. This has increased over time, with houses built recently being over 50% larger than houses built in 1900. 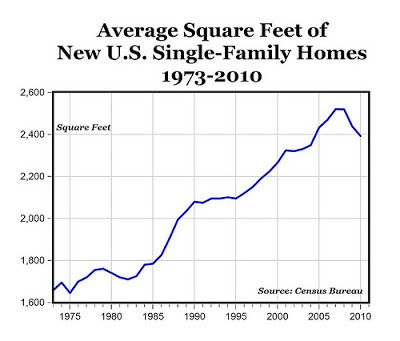 Based on the decade built, houses had an average floor area of just under 132 square metres in 1900, while houses built since 2010 are on average 205 square metres...."
This graph is self-explanatory, and agrees with Tommy's house size for 2010. I imagine that New Zealand more or less fits with Australia. You can readily see how average size reduces with density, and also where home sizes - even those that are detached - are smaller, and less inclined to the McMansion style. This graph shows what is beginning to happen in the USA, and what needs to happen here in New Zealand. Average home areas are falling - and presumably home build costs are falling too. 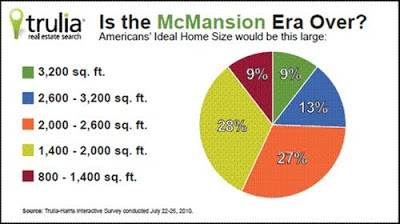 The McMansion era is coming to an end. For all sorts of good economic reasons I suspect. And the same thing needs to be accelerated here in New Zealand. Please, Nick Smith, no more fiddling with developer levies to make speculative McMansion building more lucrative for get-rich-quick developers. Time for a more responsible approach. This graph is based on a survey of what Americans now say (in 2010) their ideal home size would be. Sure there are plenty who want a big house, but there's a lot want a house between 800 and 2000 square feet in area. If Government wanted to incentivise the construction of smaller, less McMansionish homes in Auckland, it could do a lot with development levies by linking them to the number of bathrooms and the number of garages proposed in a housing unit. 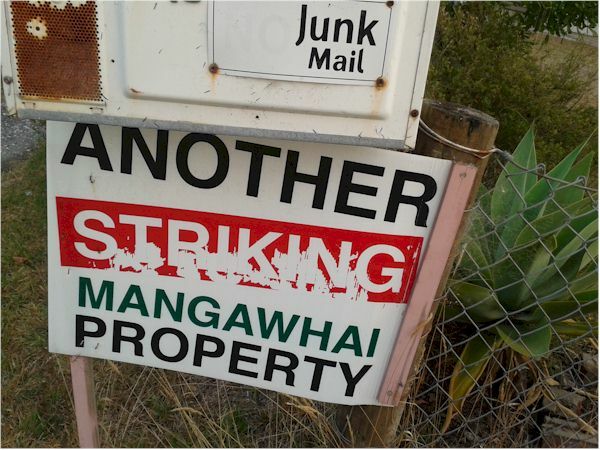 Boonham on Mangawhai: Who is Responsible? 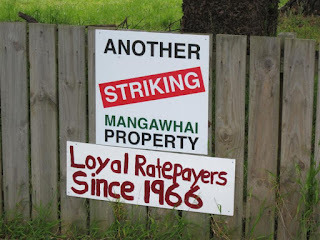 I am a bach owner at Mangawhai Heads and have been steadily drawn into the campaign about the wastewater system (known as EcoCare), rates, Kaipara District Council behaviour and so on. One of the locals who has been particularly assiduous is retired lawyer Clive Boonham. He has been running a website on his investigations for the past few years. You can see it here. Legal Eagle believes that the decision to extend the EcoCare project and to almost double the debt was illegal and ultra vires (outside Council's legal powers) because Council failed to go through the decision-making process specified under the Local Government Act (LGA) and because it failed to meet the requirements of the LGA in respect of consultation with ratepayers. It was obliged to issue a new statement of proposal and go through the special consultative procedure with ratepayers before making a decision on the scheme and the debt..
Not only did it not satisfy any of those compulsory requirements, it did everything in secret and hid all the details of the extended scheme and the increased debt from ratepayers for many years. This was a deliberate breach of the law and a breach of trust by the Council. So, who is legally responsible for the illegal debt? The government, according to John Robertson (Chairman of Commissioners appointed by Govt to run Kaipara District Council), has made it clear that it is not going to bail out the Council. That may well be its stance. It may deny any liability . But, as in any case where liability is disputed, it is for the court to decide who is to be held legally responsible. The government is not exempt from liability. More of that later. The ratepayers also state that they are not going to bail out Council. Of all the parties involved they were the innocent party. They were the victims of a cynical, deliberate fraud and deception that should have landed the perpetrators in jail. • As a fiduciary (trustee) of the ratepayers, councillors or commissioners must always act in the best interests of ratepayers and not third parties (the government or the banks). A fiduciary cannot bill a beneficiary for debts illegally incurred by the fiduciary. 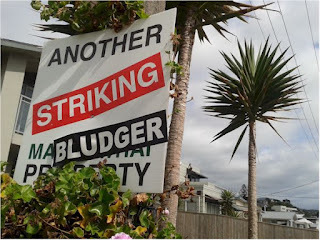 One of the basic misconceptions about local government in New Zealand is that the ratepayers of a district are responsible for all the debts of the local authority no matter whether those debts are legal or not. Ratepayers are the scapegoat and the easy target for incompetent councils. This misconception is based on a superficial reading of a section in the LGA which states that debts entered into by a local authority are deemed to be valid and enforceable even though they were secured in contravention of the requirements of the Act, or even by fraud. It is true that the bank can appoint a receiver who has special (but limited) power under the LGA to set a rate to cover the repayment of the debt. The problem is that the LGA is very loosely drafted and the special power to charge a rate to repay the debt is only granted to a receiver. The Council itself - whether operating through councillors or commissioners - has no such power. When setting rates it is still bound by the principles of the LGA - the four well-beings - and by its fiduciary (trustee) obligations. This means that a council cannot set draconian rates to repay an illegal debt that effectively destroy the communities in the district simply to appease the government and the bankers. The ratepayers best interests come first. The commissioners and the government are not going to acknowledge the legal situation because it puts at risk the whole basis of ratepayer liability, and if Kaipara ratepayers manage to reject liability for illegal debts then the flood-gates will open, and the whole of local government in NZ will be turned on its head. That is why ratepayers need to file proceedings in court to ensure that they are not made the scapegoats for the fraud that has been committed on them. If ratepayers are not responsible for the debt, then who is? Quite clearly those who were negligent, incompetent and were responsible for the massive and illegal blow-out of borrowings and the illegal actions. If you want to know who the suspects are then simply look at the crime scene and see who was involved in the fiasco. The forensic boys then need to examine the role played by each participant to see what responsibility they carry for the losses. The commissioners have already acknowledged in the recent letter from John Robertson that Council (the former Chief Executive and the elected Councillors) were negligent, so that is a good start. The former Chief Executive, Jack McKerchar, who was employed by the Council for 12 years, has to bear the major responsibility for the ruination of our beautiful district. The impact that his incompetence and his illegal forays have had on our communities and individuals is immeasurable. It may take generations for the district to recover and many lives will have been ruined by his arrogant disregard of the law and correct procedures. It is my personal view that his behaviour was so bad, and the effect that he has had on the whole community so great, that he should be serving a term in prison. Jack McKerchar should have insurance to cover his negligent acts, and he should be the first target. Councillors may well be uninsured but they are still liable, in the same way as company directors, for the breach of their duty of care. Jack McKerchar could never have got away with what he did if he had not had a bunch of dopey councillors who abdicated all responsibility for decision-making and allowed him total latitude to wreak his special type of havoc. There were of course some Councillors like Bruce Rogan, Bill Guest, and Jonathan Larsen who did what they could to counter the excesses of the McKerchar dictatorship, but by and large the councillors failed miserably in their legal obligations. The role played by consultants and advisers also needs to be scrutinised. You have to ask yourself how the Council could spend the vast sums of money that it did on consultants and legal advisers and yet get itself into such a financial and legal pickle. It looks as though there may be some negligence lurking there. In respect of the EcoCare, the ultra vires extension of the scheme, and the ultra vires debt, it is essential that the roles of the financier, the contractor and Council's consultants and legal advisers need to be examined. I find it hard to believe that all of those competent and experienced people (and experienced in dealing with local authority projects) were party to an arrangement to build a sewerage scheme for a local authority that involved massive costs and debt, yet not one of them appeared to know that the LGA required specific decision-making and consultation processes before any decision could be made or any contracts signed. Did they all suffer from John Key's brain-fade? As a lawyer myself I understand the obligations that a lawyer has when advising a client on a project and a debt, and the liability that a lawyer faces if he fails to advise a client on the appropriate legal processes. That is why clients use lawyers. A cursory glance at all the various reports that the consultants used to persuade Council to undertake the EcoCare project and to extend it seem to me to be riddled with assumptions and financial models that have little solid basis, and it is appears to me that the whole scheme was a massive financial gamble based on flimsy figures and projections. Experts need to examine the role of consultants, advisers and lawyers to see if there was any evidence of negligence on their part. If there is then action must be taken against them. What of the contractor who built the plant? From the information available to ratepayers it seems that the EcoCare plant is not what we contracted for. The expression "not fit for purpose" is being bandied about. Were we sold a dud? Steve Ruru (acting CEO of Kaipara District Council) has acknowledged that the plant can cope with no more than the current 1200 connections (out of a promised 4,500) without massive further expenditure. The discharge farm also appears to be unsuitable for soakage even though a report from a consultant recommended it. The Bicknell report that was commissioned by Greg Gent (Chair of the Govt appointed Review Ctte that was set up before Commissioners replaced Councillors and Mayor) to ascertain the status of the EcoCare plant appears to have disappeared into the mists. The valuations for the plant seem to support the view that there is a short-fall in value. That seems a fertile area to inquire into to see if Council has a case to recover a substantial sum from the contractor in an action for breach of contract. The big question of course is the role of the Office of the Auditor-General and whether that Office is liable for the financial and legal problems facing Council. The OAG has two basic roles. One is that of auditor to the Council to ensure that the Council's plans and accounts meet the audit requirements and satisfy legal and accounting requirements. The second is a general role to act as a watchdog to ensure that Council acts appropriately and to protect the best interests of ratepayers. It has been my view for some time that the OAG has failed miserably to perform both those roles. I suggest that if the OAG had performed its roles satisfactorily then Jack McKerchar and his complicit Council would not have been able to get away with years of incompetence and flouting legal requirements. Our complaints were dismissed by the OAG. I got the distinct impression that the Office was not the slightest bit interested in reining in local authorities that were clearly operating outside the legislation. I also suspected that the legal people at the OAG had no understanding of the law relating to rating and setting rates. Either that or they simply did not care if rates were set incorrectly. It is interesting that last year the Deputy Auditor-General Legal came to Kaiwaka to meet with us and apologised on behalf of the Auditor-General for her failure to pursue the matter when we first complained. We were then advised that there would be a full inquiry into EcoCare. However, that inquiry only came about because, in spite of the OAG's indifference, we had continued to press Council until it obtained the Salter report which confirmed our submissions on the legality of rates, and because Legal Eagle made further submissions to the OAG on the illegality of the decision to extend the EcoCare scheme and double the debt. If ratepayer representatives had not taken the initiative and kept up the pressure it seems that the OAG that would have been happy to sweep the whole debacle under the carpet. This has been a dreadfully shoddy performance by the OAG and the legal experts need to have free rein to see if legal action should taken against the OAG. We finally come to the Minister of Local Government and the government itself. Rodney Hide, as Minister, played for time and did very little to bring Council to account even though he was fully advised of the problems and illegalities. He put the Council "on watch" but little else. The Minister' Office only took decisive action after mounting pressure from ratepayers and far too late to salvage anything from the destruction of Kaipara. The government has a broader role in this debacle. The government has a constitutional obligation to ensure that the powers of local government (which devolve from central government) are exercised appropriately by local authorities, that they act within the law, and that the rights of citizens are protected. The government failed miserably to perform its obligations. It is blaming the obvious short-comings of local government on the deficiencies in the legislation but it is clear that the problem lies in the way the government performed its own obligations. The watchdogs that it appointed - the Ombudsman and the OAG - are underfunded and toothless and do not have the necessary powers or, apparently, motivation to police their areas of responsibility. They are very much like the old Securities Commission which sat by while renegade finance companies pillaged the life savings of New Zealanders. The Office of the Minister, which should be a back-stop to pick up missed balls, went AWOL. The government's attempt to dump liability for local authorities' excesses and illegalities on innocent ratepayers is shameful. It relies on ratepayers not having the financial backing or the courage to stand up to the government and seek redress from the courts. That is a serious misjudgement on the part of the government. Kaipara ratepayers are not going to lie down and accept this debt. If the government refuses to listen to them and to act fairly within the law, they will reluctantly, but steadfastly, take the legal action that is appropriate to ensure that those who are truly responsible for the fraud that was perpetrated on the people of Kaipara are held responsible in law.